Although there are published studies of proline biochemistry and nutrition in cultured cells and postnatal animals, little is known about proline metabolism and function in the conceptus (embryo/fetus, associated placental membranes, and fetal fluids). Because of the invasive nature of biochemical research on placental and fetal growth, animal models are often used to test hypotheses of biological importance. 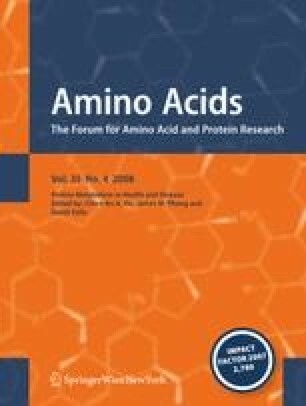 Recent evidence from studies with pigs and sheep shows that proline is a major substrate for polyamine synthesis via proline oxidase, ornithine aminotransferase, and ornithine decarboxylase in placentae. Both porcine and ovine placentae have a high capacity for proline catabolism and polyamine production. In addition, allantoic and amniotic fluids contain enzymes to convert proline into ornithine, which is delivered through the circulation to placental tissues. There is exquisite metabolic coordination among integrated pathways that support highest rates of polyamine synthesis and concentrations in placentae during early gestation when placental growth is most rapid. Interestingly, reduced placental and fetal growth are associated with reductions in placental proline transport, proline oxidase activity, and concentrations of polyamines in gestating dams with either naturally occurring or malnutrition-induced growth retardation. Conversely, increasing proline availability in maternal plasma through nutritional or pharmacological modulation in pigs and sheep enhances concentrations of proline and polyamines in placentae and fetal fluids, as well as fetal growth. These novel findings suggest an important role for proline in conceptus metabolism, growth and development, as well as a potential treatment for intrauterine growth restriction, which is a significant problem in both human medicine and animal agriculture. This work was supported by National Research Initiative Competitive Grants no. 2001-35203-11247, 2003-35206-13694, 2005-35203-16252, 2006-35203-17283, 2006-35203-17199, and 2008-35206-18764 from the USDA Cooperative State Research, Education, and Extension Service, by NIH grants no. 1R21 HD049449, 5P30ES09106, and R25 CA90301, and Texas Agricultural Experiment Station (Hatch Project #82000). Our research projects with pigs and sheep were approved by Texas A&M University Animal Care and Use Committee. We thank all research personnel in our laboratories for technical assistance, Mr. Kenton Lillie for assistance with animal husbandry, and Ms. Frances Mutscher for office support.